But whether he beat Bobby Flay, we will have to wait to November to find out. Last Thursday, Harold Baker, Executive Chef at Gary’s on Spring, competed on the Food Network show “Beat Bobby Flay.” Though he was excited to talk with F&D with the experience, those pesky protocols of reality TV that keep the outcome in suspense until broadcast time prevented him from revealing too many details. Baker was, however, eager to talk about what led up to his appearance on the Food TV show. “I had always had a dream of going to New York City,” Baker said, but until last week he had never made the trip. And so his first trip was made in style, with his airfare paid, and his trip from the airport to the TV studio made in a limo. Denny tried out Baker’s Big Daddy Hot Brown. 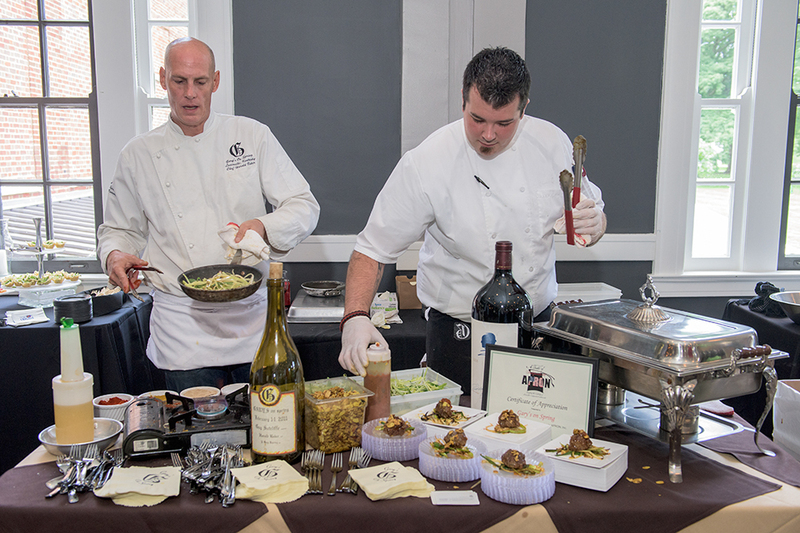 According to Baker, the Louisville episode, which also included very large portions of signature dishes prepared by Come Back Inn and Mussel & Burger Bar, garnered one of the show’s largest audiences. Perhaps fired up by his “Ginormous Food” appearance, Baker started some applications to appear on other shows. Then, he got a call from the Bobby Flay organization, inviting him to apply to appear on the “Beat Bobby Flay” program. That application, Baker said, took him four hours to fill out. Baker had to undergo several interviews with the producers, but finally got accepted, and last Wednesday was flown to New York City for his first visit to the Big Apple. The next day he underwent the performance ordeal, wherein he first competed to create a dish under a time limit, in competition with another guest chef. The winner of that competition would have the privilege of competing in cooking against Bobby Flay. All Baker could reveal about the outcomes was that in his first round, he finished his dish with a margin of just 7 seconds left on the clock. For broadcast purposes, after the actual cooking, Baker was asked to look at the tape and do a voice-over explanation of what he was doing and thinking during the cooking process. The producers, Baker said, were impressed that after the chaos of the taping, he was able to stay in character and do his voice-over with the energy and enthusiasm that matched his action at the stove. The taping of the voice-over process was interrupted by a cacophony of sirens. Though the sound of emergency vehicles is not uncommon in The City, it turned out that what they were hearing in the studio, about three blocks from Times Square, was the response to the bizarre event that made national news, in which a car driven by a perhaps impaired driver barreled up a one-way street and into a tourist crowd, killing one and injuring several. Harold Baker’s first trip to NYC will remain with him for a long time, for a lot of reasons. Whether one of those reasons is that he beat Bobby Flay we will have to wait several months to find out. F&D will be sure to tell you when to tune in.